Released by Criterion's UK arm in the same month that the label release Wes Anderson's The Royal Tenenbaums, Noah Baumbach's The Squid And The Whale makes for a very comfortable bedfellow with Anderson's offering. Indeed, it's little surprise to find Anderson's name amongst the credits, here in a producer capacity, Baumbach having co-written Anderson's film of the previous year, The Life Aquatic With Steve Zissou. If The Squid And The Whale doesn't quite go for the same level of distance from reality as Zissou, then you can still see Anderson-esque touches here and there that influence your take on the action, heavily influenced as it is by Baumbach's own early life. Several characters, most notably Bernard (Jeff Daniels), speak in such an emotionally detached way as to not entirely be aware of their surroundings and partners on the stage. It's a mixture of aesthetic frankness and belligerence and it is very reminiscent of Anderson and his fictional proteges. 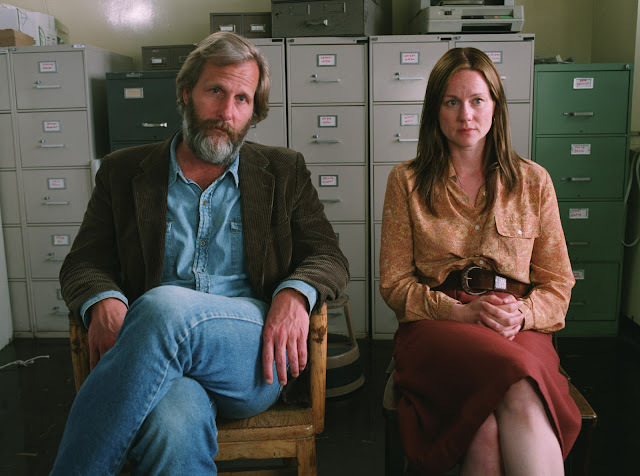 Dealing with divorce in a measured and occasionally gripping way, Baumbach's film gives each side fair shrift. Bernard is the biggest candidate to be prime idiot and, indeed, in a later glimpse into his relationship with Lili (Anna Paquin) he may be more than that, but for the most part he's the main source of humour; a simultaneously bumbling and clever oaf, about to muddle through single parenthood. Joan (Laura Linney), seeking out new loves, is often a perfect picture of motherhood under stress, attempting to escape the shadow of her husband. That shadow may not really be there, but is constantly re-enforced by eldest son Walt (Jesse Eisenberg), convinced of his father's genius. Walt and Frank's (Owen Kline) development forms the meat of much of the plot, as you might expect from something biographically related to the director's own formative years. A decision to tackle something this close to home comes with innate risk, but Baumbach is either unflinchingly honest or able to rustle up attractively daft fictions which put his young avatars in uncomfortable yet compelling situations. Walt is expressly and hilariously awkward in his fledgling romances, in a way only Eisenberg could manage to embody. Frank's strange, erm... 'expressions' of rebellion amongst the library books and locker-packed hallways of his school are the things of parental nightmares. The result is something which, similarly to the best Anderson productions, feels just about enough removed from reality to convince you of its own brand of authenticity. It's simultaneously human, real; absurdly hilarious and bizarrely unreal. Yet it still manages to be the kind of quiet Indie Drama that effortlessly leaves you with a picture of a struggle that could be happening just next door. The Squid And The Whale is released on Criterion UK edition on Monday 5th December 2016.